New appliances were acquired and connected with Aquatherm Green Pipe. 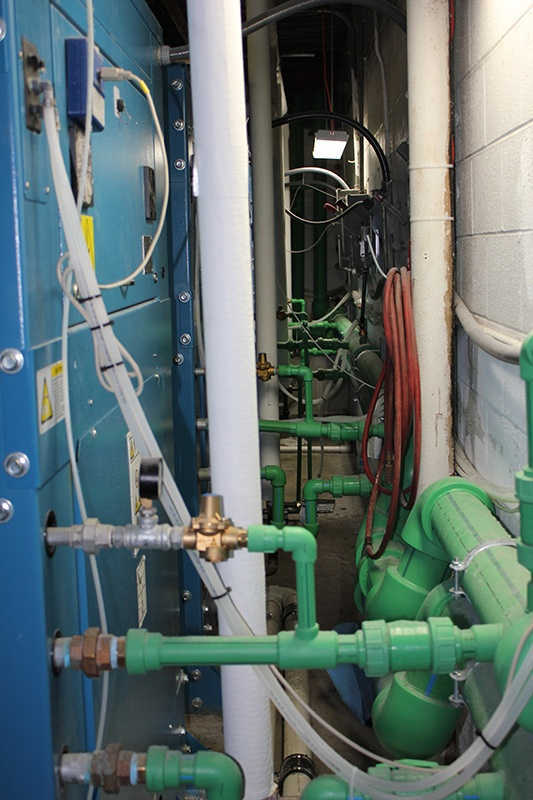 "We were confident that Aquatherm piping was the right choice based on the application. We showed the customer a sample of the Aquatherm pipe, explained the history and how long it’s been in service. We explained the cost and speed of installation, and they were on board with it." Material cost for Aquatherm PP-R piping came in at 30% less than copper. Unlike copper, PP-R resists abrasion and does not corrode or scale. Significant labor savings thanks to heat-fused connections, including saddle-type fusion outlets installed onto a pre-drilled supply pipe. The facility’s laundry equipment and copper piping were failing after years of use and required replacement. Nashville, also known as ‘Music City,’ is home to the Grand Ole Opry, The Country Music Hall of Fame, and countless music venues where musicians from all over the world come to play, write songs, and sing tunes. With over six million visitors to the city per year, the hotels in the area are constantly busy. One hotel in particular attracts a lot of visitors with its rotating rooftop restaurant that offers spectacular views of the Nashville skyline. The Sheraton Nashville Downtown Hotel is the 12th tallest building in Nashville and is only blocks from the Nashville Convention Center. In order for the Sheraton to accommodate the number of guests staying at the hotel each year, the laundry facility at the 28-story hotel must be in top shape to ensure all guests have clean linens and towels upon request. 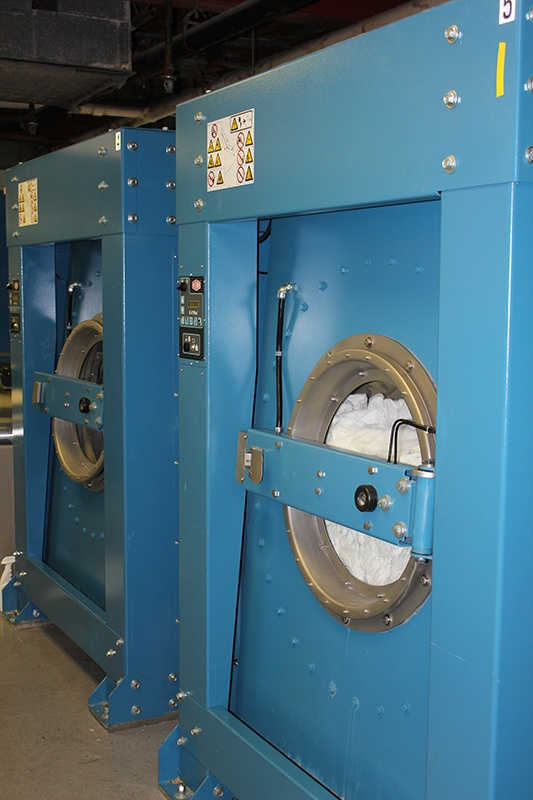 The hotel’s owners decided in late fall of 2011 that it was time to replace all the existing laundry equipment to handle the facility’s flow of laundry. The hotel owners called Demand Mechanical, a Nashville-based contracting firm, to work on the project. “The solenoid valves on the washer machines were busting and breaking the pipes. The equipment was just worn out,” explained Rick Hollis, with Ferguson Enterprises Nashville, which serves as the local Aquatherm manufacturer’s representative. Aquatherm Green Pipe® is a pressure piping system that’s designed for hot and cold potable water applications. 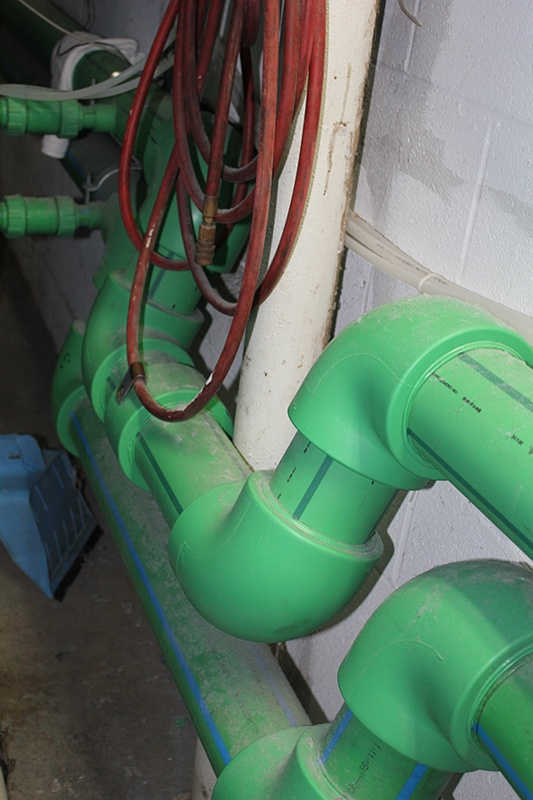 On this job in particular job, Green Pipe helped solve problems the laundry facility maintenance staff had been facing: It won’t corrode, scale, and is virtually leak-proof when properly installed. The project began the first week of December 2011 and was took roughly a week to finish. The 1,500-sq-ft laundry facility, which normally operated for 12 hours per day, had to be completely shut down during that time. The Demand Mechanical technicians installed 100 linear ft of 4-in. Aquatherm Green Pipe with 15 connections, and 60 linear ft of 1-in. Green Pipe. The water mains ran from the floor through four penetrations and dropped down horizontally across the wall behind the machines. All the branch lines were made with Aquatherm fusion outlets that were bored through the 4-in. main headers to feed each washer. Hassett used a portable Aquatherm welding machine to weld and connect the 4-in. and 1-in. piping to the Chicago® brand laundry equipment. Aquatherm fusion outlets are heat-fused saddle type fittings that can offer significant labor savings, allowing installers to simply drill into the supply pipe and then install the fusion outlet fitting into place wherever needed. A portable Aquatherm welding machine developed for stationary welding of pipe and fittings was used on this project. It is equipped with a hand crank to help pull the pipe and fitting together as they are both heated on the iron, which is heated to 400-500°F. For the 4-in. connections, the pipe and fitting were left on the iron for a minute, while the 1-in. connections took less than 10 seconds. All Aquatherm pipes and fittings are made of Fusiolen PP-R, a low friction material that offers a wealth of benefits. One such benefit is that it is abrasion resistant and also reduces pressure loss. The walls of the PP-R piping systems generate less friction than other systems, eliminating the abrasion that can cause pinhole leaks and shorten the life cycle of other pipe systems. Additionally, since the pipe has a natural R-value, even when 180° fluid is flowing through it, it doesn’t get hot to the touch. “I like the fact that the pipe doesn’t burn us if we touch it. That makes it easy to work around,” Randy Moore, director of engineering at the Sheraton added.